Maun proved to be a much-needed stop after the many hectic bus rides. We arrived at the hotel in the afternoon. Reuben was kind enough to walk us across the Old Matlapaneng walking bridge. We were dropped off in the hands of a recent resident who graciously shared the load of my ridiculously heavy backpack through a grassy walking path and down the dirt road that led us to the Old Bridge Backpackers camp. People seemed a bit reserved at first, but I was grossly mistaken. 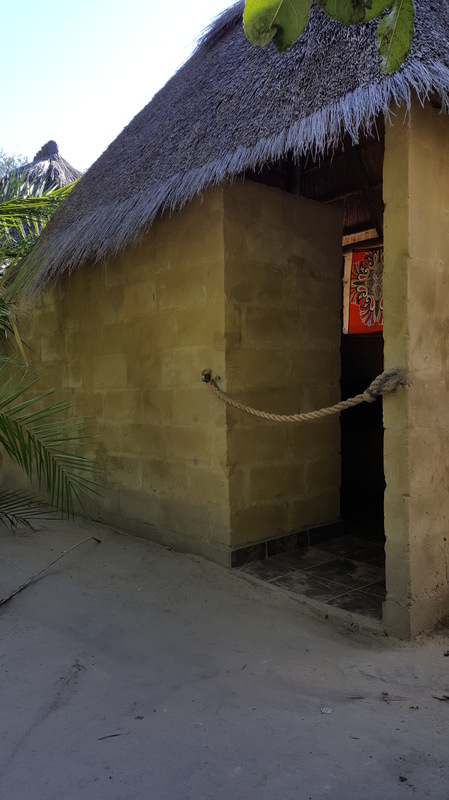 We were shown to our initial nights stay – the only available accommodation given our fairly delayed request – a hidden tent, covered with beautiful flowers, with shared ablutions (a word I would come to be very familiar with, which means showers and washrooms). We would have to become quite trusting with the lock of the bathroom, simply being a very pliable piece of rope. I got used to this until one day, two ladies who were just visiting the camp site giggled loudly through the toilet “lock” as I was unbuttoning my pants…suffice to say my embarrassment was professed with red cheeks and an “it’s there for a reason” exclamation. That night, Vivek and I froze as the afternoon sun’s high temperatures plummeted to the single digits (Celsius, of course). This region’s weather changes are seriously bipolar! My seemingly unecessary mini-hot water bottle has been a saviour. The next day, we moved to an en-suite arrangement, which ensured that we had a bit of privacy and a lovely view of the Thamalakane River, still very very cold at night. All this was affordable with just about $18 more per night (about $9/person/night). The Old Bridge Backpackers bar and restaurant location was glorious, with a sprawling tree touching the river edge and the sun shining through. We heard frogs all night and had plenty of visits from the birds trying to find a crumb or two. Brick oven pizzas, local beer, and decent WiFi made the area an often point of contemplation and catching up. We stayed in Maun for about 3 days and rested up before we were to camp in the Okavango Delta for 3 days and 2 nights, covered in another one of our posts, here. We came back and stayed at the Old Bridge Backpackers again for 2 nights before heading to Namibia. Although we didn’t take too many pictures of our trek to town, Maun was a quiet town, surprisingly with all the big South African supermarkets, and an abundance of taxis that made their presence known with a gentle short honk of their horns. Should you look up and show an interest, they’d pull over and hope you were going to take a special fare for 40 Pula ($4) rather than the shared taxis service for 4 Pula. Maun was also filled with a lot of tourists and so, there was a patch of markets like this on the main road into town. Trying to be productive and trying to take a skill away from Botswana, aside from the very important greeting-with-a-smile and saying thank you with your hands cupped together as we do in Zambia, I spent a few hours and $20 to learn how to weave the beautiful palm baskets that we found everywhere in Botswana. My teacher, Tithaku was lovely, motherly and very open-minded. We spoke about varying topics, including culture, religion, education, and her desire to open a vocational and small-business training site for youth who have very few options to support themselves. It was extremely enlightening and encouraging. Maun was a really lovely place and I am sure we will go back one day. Shweta I want to learn the basket!